There is a rabid subset of gamers that drive the pure simulation gaming market, and Industry Manager - Future Technologies was developed, no doubt, with these gamers in mind. 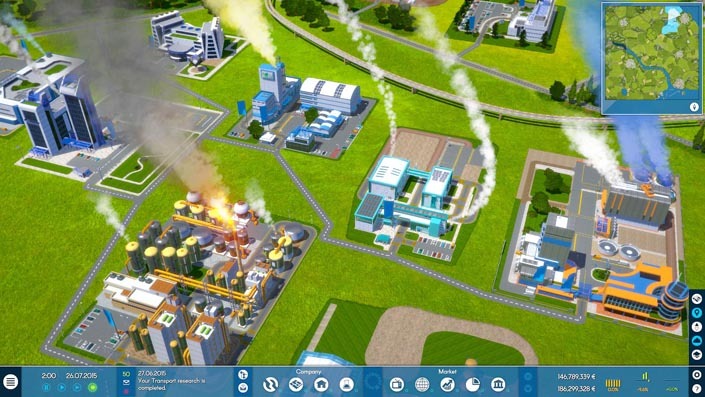 Although there are simulation games that many people are familiar with and enjoy - think SimCity or simply, The Sims - these do not come close to the level of simulation that games like Industry Manager - Future Technologies provide. Industry Manager - Future Technologies is an economic simulation game that challenges the user to create a company that develops products set within one of six industries (Fashion, Food, Accessories, Biotechnology, Software, and Personal Electronics). These industries are varied in difficulty based upon the type of production chain utilized, ranging from simple to complex. Upon launch, the user is tasked with choosing which industry they want their fledgling company to represent, the logo, and a generic profile model that will represent the face of their company. I am by no means the type of gamer that absorbs simulation games to the level of other players, which is why it was a unique and rewarding experience to test my understanding of what represents enjoyment in a gaming environment like this game. After creating a company in the software industry, a simple production chain by the way, I set out on my journey to learn the game. Immediately I was met with the harsh reality that although I had chosen the most simplistic of production chains, I had no idea how to progress. I believe that it was my hubris that prevented my from playing through the provided tutorial before launching, and I was quickly shown that I was out of my depth as a gamer. After exiting my game and going through the tutorial, which had a fairly thick 65 help tips that were walked through, I once again felt that I was ready to play. Spoiler Alert: I was wrong again. I am not sure if it is my relative inexperience in the genre, or a clunky user interface, but I felt lost more often than not when trying to play. It doesn’t help that all currency and quantity information is listed in European format, and there is no option to change it. That may seem like a nitpicky detail, but for a gamer looking for any way to connect, the European default simply helps maintain the feeling of being out of one's comfort zone. An example of this was evident in the tutorial where I was tasked with setting a production queue at 80, but inadvertently set it at 81,63, and was unable to change it or progress without forcing the tutorial progression. Industry Manager has simple graphics that lend themselves well to simulation gaming, and feel very similar, aesthetically, to Cities: Skylines. There is some blur with graphical settings maxed out when zooming in on buildings or the city, which is strange, but nothing limiting of gameplay. All of the mechanics seemed to work just fine. It is more about broad accessibility than an inability to progress. After spending a year in game of seemingly developing my products through the use of production lines, warehouse transfer schedules, and shop-front sales within the local city, I was surprised to see that I had only successfully lost a bunch of money since beginning. Compounding the issue was my inability to understand how the Research and Development building which I had hired 48 researchers to man had any impact on what I was doing at all. How does one apply their research of advertising methods to the gameplay, and why doesn’t the number of units sold in the shop ever seem to increase? I had to actually learn how to succeed on my own merit. When unsuccessful in game it wouldn’t leave me destitute in ruination as it would in real life, I could simply restart and learn from my mistakes. This is the true beauty of a game like this in my perspective. Maybe that is exactly the point though, Industry Manager - Future Technologies wasn’t developed for broad accessibility, it was developed to scratch the itch that simulation gamers have, an itch that is not scratched easily.